Gabby Bernstein has a new book out called The Universe Has Your Back. 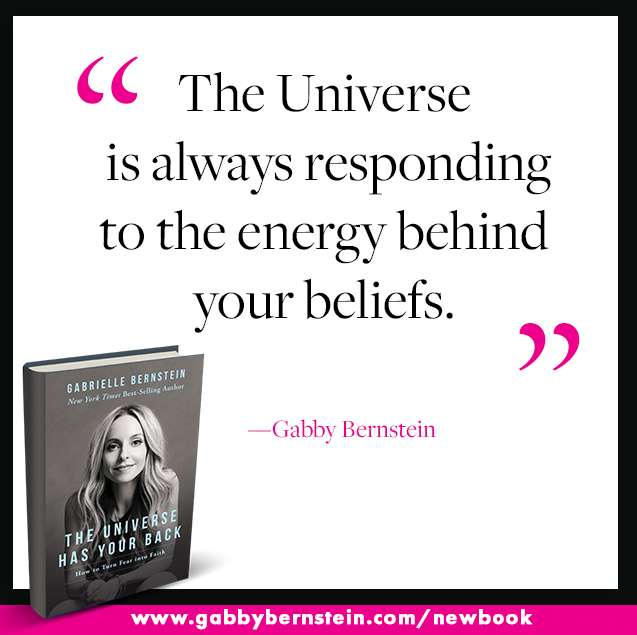 Gabby’s intention for this book is to help readers transform fear into something more postive. It contains stories and lessons to guide you to release blocks to happiness, security and a clear sense of direction, confident that the universe has your back. Here is one meditation from the book. We must learn to train our mind to create with love rather than with fear. This exercise is a great practice for you to begin awakening to the power of your own creations. Begin the practice of image making by answering this simple question: What do you want to see? Be unapologetic about your answer. Maybe you want to see a world without war. Maybe you want to see yourself in a wildly romantic relationship. Maybe you want to see yourself walking through life free from fear. Create the images that you most long for. Write down your answer now. What do you want to see? Next, reread your response and then close your eyes and sit in stillness for five minutes. Sit up straight resting your hands on your thighs with your palms facing upward. When you sit up straight with proper, natural (not stiff) alignment, you become a channel to receive positive energy. Close your eyes and turn your focus inward. Allow your inner spirit (your inspiration) to come forth and surrender to the images that you want to see. Let the wisdom within you create images in your mind’s eye. Surrender to this wisdom now. Breathe deeply in through your nose and out through your mouth. With each inhale and exhale surrender more fully to the visions that you want to see. Consciously focus your attention on them. Allow visions of what you want to guide you on a journey of new perceptions. Sit as long as you wish. When you’re ready, gently come out of your meditation and take a moment to jot down any images that may have come through. Maybe what you want to see is a newborn baby and in your meditation you saw the eyes of a child. Or maybe you long for a romantic partner and in the stillness you saw yourself in a warm embrace with a lover. It’s even possible that you saw images that were far less literal and in time you’ll come to understand the message behind them.